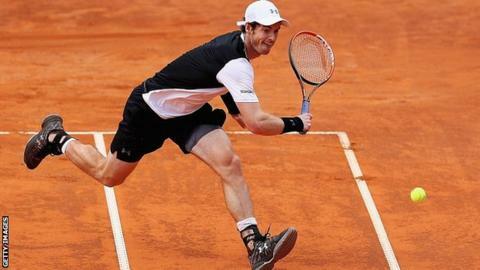 Britain's Andy Murray reached the semi-finals of the Italian Open with a 6-1 7-5 win over Belgium's David Goffin. In windy conditions, Murray lost his first service game to love but won six games in a row to take the first set. Murray, 28, was pushed hard in the next set but the second seed battled through to face France's 'lucky loser' Lucas Pouille in Saturday's last four. World number one Novak Djokovic beat Rafael Nadal for the seventh time in a row, winning 7-5 7-6 (7-4). The defending champion will meet Japan's Kei Nishikori after the sixth seed beat Austrian Dominic Thiem 6-3 7-5 in one hour and 39 minutes. Djokovic, who beat Murray in the Madrid Open final last week, has now won his last 13 matches and is bidding for a fifth title in Rome. Murray, after dominating the first set, had to dig deep in a fluctuating second set as both players struggled to hold serve. Goffin, the world number 13 who beat Tomas Berdych 6-0 6-0 the day before, broke serve in the fourth game to lead 3-1, in the eighth game when Murray twice double-faulted, and again when Murray was serving for the match at 5-4. But Murray kept breaking back and won a nine-minute 11th game to set up another chance to serve for victory. Murray, who has yet to drop a set in Rome this year, completed the job to reach his second Italian Open semi-final after one hour and 34 minutes on court. "The conditions are extremely difficult," said Murray, who will return to number two in the rankings on Monday. "The wind is swirling and changing direction in between points. Also there's no clay on the court either. "Sometimes when they put clay on in between games it's slow, but two points later its all blown off and it's like playing on a hard court. "It was obviously difficult, challenging and frustrating conditions. It's difficult to play great tennis." Pouille advanced to the last four courtesy of a walkover win against the injured Juan Monaco, the second time he has progressed in the tournament without hitting a ball. After falling in the final round of qualifying, the 22-year-old Frenchman was granted a place in the main draw when countryman Jo-Wilfried Tsonga withdrew. The world number 52 beat Ernests Gulbis in the second round and reached his first ATP Masters quarter-final by ousting ninth seed David Ferrer 6-4 6-1. "There are not many things to say except that I'm lucky this week," admitted Pouille. "I should not be here, I lost in qualifying and I'm in the semi-final. I'm very lucky and I cross my fingers it stays that way." Murray is taking nothing for granted, saying: "He beat Goffin last week in Madrid and Richard Gasquet in Monte Carlo. This week, he's been a bit fortunate, but he's very good. I don't expect it to be easy." Nadal, a seven-time winner of the tournament, started well and broke to lead 3-2 but Djokovic recovered to level at 4-4 and then won the first set on his fourth set point. In the second set Nadal broke in the opening game and despite calling the physio because of pain in his left foot, he held his advantage to lead 5-4. Serving for the set he held five set points but Djokovic saved the lot and broke back, eventually sealing the match in the tie-break. "I held my nerve at the clutch moments," Djokovic said in an on-court television interview. "It's a straight-sets win, but it feels like we played five sets. "Winning against Nadal is the ultimate challenge on clay courts and one of the toughest challenges we have in sport." Jamie Murray's hopes of regaining the number one doubles ranking he lost last week ended - for now at least - with defeat in Rome. A win would have taken the Scot back to the top of the rankings but he and Brazil's Bruno Soares were seen off with little fuss by the formidable Bryan brothers. The Americans won 6-3 6-4 to advance to the semi-finals. Coming soon: We're launching a new BBC Sport newsletter ahead of the Euros and Olympics, bringing all the best stories, features and video right to your inbox. You can sign up here.